Major cuts exposed by FE Week to apprenticeships funding for 16- to 18-year-olds in some of the most deprived areas of the country has been raised during education questions, with our #SaveOurApprenticeships campaign repeatedly name-checked on the floor of the House of Commons. 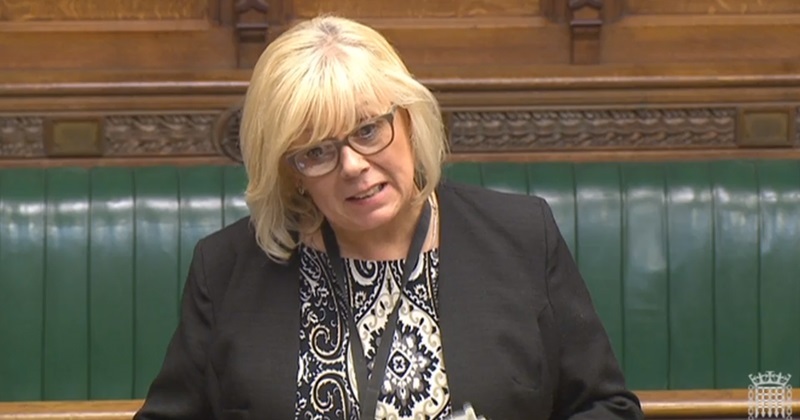 Mary Glindon, Labour MP for North Tyneside (pictured above), asked during education questions what assessment had been made of the potential effect of the Department for Education’s proposed change to apprenticeship funding rates on the take-up of apprenticeships? The question was answered by apprenticeships and skills minister Robert Halfon, who said: “The proposed apprenticeship funding policy has been designed to support an increase to the quality and the quantity of apprenticeships. “Incentives and support for providers are included in our proposals. These will encourage the take up of many more apprenticeship opportunities by people of all ages and backgrounds, giving many people the first step on the employment ladder of opportunity. Shadow skills minister Gordon Marsden was then dismissive of the minister’s answer and called the plans a “shambles”. He pushed his government counterpart for a response on the issues, and referred to FE Week’s Save our Apprenticeships campaign launch on September 14 in his question. “He knows it’s a shambles. It’s nearly a month since he and I spoke to a full house of sector leaders in the commons and heard it from them,” Mr Marsden said. In his response Mr Halfon name-checked the campaign. Mr Halfon continued: “If that’s not saving apprentices, I don’t know what is. The stark drop in funding exposed by our exclusive analysis had already prompted a furious backlash – with more than 600 people posting written messages pledging support for FE Week’s first official campaign. Our findings on the impact of apprenticeship funding reform also provoked Mr Marsden and more than 50 other MPs led by Tottenham’s David Lammy to write to the government begging for a change of heart. Mr Marsden told Labour delegates at conference that the government needed to be “very clear” that they were being “watched very carefully”, and warned they had form when it came to “disappointing 16 to 18-year-olds over apprenticeships”. Senior politicians from across the political divide, including skills minister Robert Halfon, who defended the cuts, previously spoke at the launch of the campaign. It took place on the same day that Theresa May was asked about the issue during Prime Minister’s Questions, when she told the Commons that she “does not recognise” that there will be cuts of 30 to 50 per cent – even though the numbers come from her own government. What a waste of tax payers money especially the Point End Assessment. Should be scrapped and go back to how it was with improvements.